Rising 3,776 meters above sea level, Mount Fuji is Japan's tallest mountain and most iconic landmark. There are many opportunities for travelers to enjoy views of Mount Fuji, even if you don't want to climb it. If you are trying to plan your trip to see Fuji ahead of time, I suggest to not. Have a plan prepared for a couple of spots and then look at Mount Fuji Webcams and keep a close eye on the weather apps. You can do what I did, and wake up at sunrise to check the webcams. If the weather looks good - jump on a JR Train (another great reason to have a JR Pass) and go on a last minute trip to Mt. Fuji! To increase your chances of success, try to see the mountain in the early mornings or late afternoons, especially during the colder winter months when visibility tends to better than during summer. The mountain's famous snow cap is typically visible from around November to around May. Anyway, as for the best spot, there is no one true answer to finding the best view of Mt. Fuji. But, here are all the different ones so you can choose yourself!! Because of the uptick in clear days in Tokyo due to pollution reduction you can see Mt. Fuji approximately 120 days of the year! ...head to Bunkyo Civic Center. Not only is it free (!) but it is also centrally located. 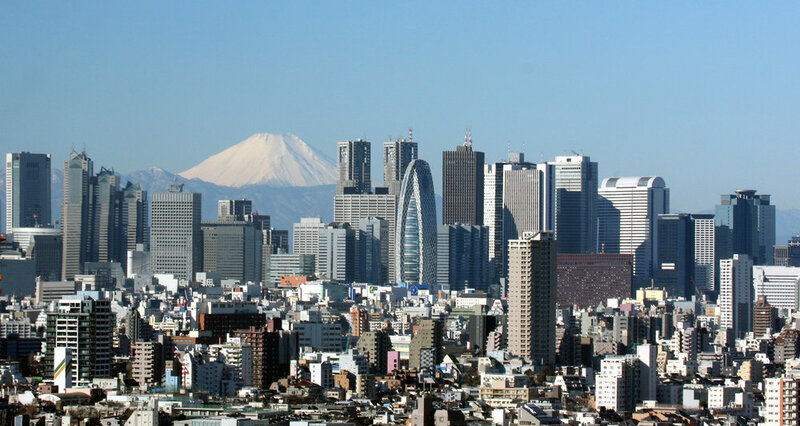 The views are beautiful since the mountain looms behind the skyscrapers of the Shinjuku district. ...or choose to head to Takaosan. This a wooded mountain in western Tokyo offers nature and hiking right near the sprawling city. Mount Fuji is visible from Takaosan's summit and the western ridge trail. This is a popular day trip from Tokyo because it is so close - it is also where I went to view the mountain. You can read my entire article, including how to get there and what to do while there, here! Do be aware that visibility is often poor, especially during midday when fog and low clouds may gather on the mountain. If you are trying to see Fuji up close coming from Tokyo you should head to the Fuji Five Lake Region! The area has the best views of Mount Fuji and there are several vantage points around the lakes that you can choose from. If you are visiting Japan during Cherry Blossom season DEFINITELY head to this view. The 5 story pagoda makes it even more beautiful. This view offers some of the most breathtaking views of the mountain that sometimes come with a reflection in the lake. In the spring the view is accompanied by cherry blossoms and the fall has beautiful fall colors. This is also the only place to get a reflection view of Mount Fuji. If you're in Japan between mid-April to early June near Lake Motosuko, the Fuji Shibazakura Festival is one of the best places to see pink moss (shibazakura). The flowers usually look best around the first three weeks of May. ...Lake Yamanakako: the easternmost, largest and second-most developed of the Fuji Five Lakes. ...Oshino Hakkai: a small, touristy village northeast of Mount Fuji between Lake Kawaguchiko and Lake Yamanakako. ...Lake Motosuko: the westernmost of the five lakes and largely undeveloped. This view is rather difficult to reach by public transportation as many buses only stop along the eastern side of the lake. If you don't have enough time to visit a region, you can catch it on a clear day while riding the train to various locations! 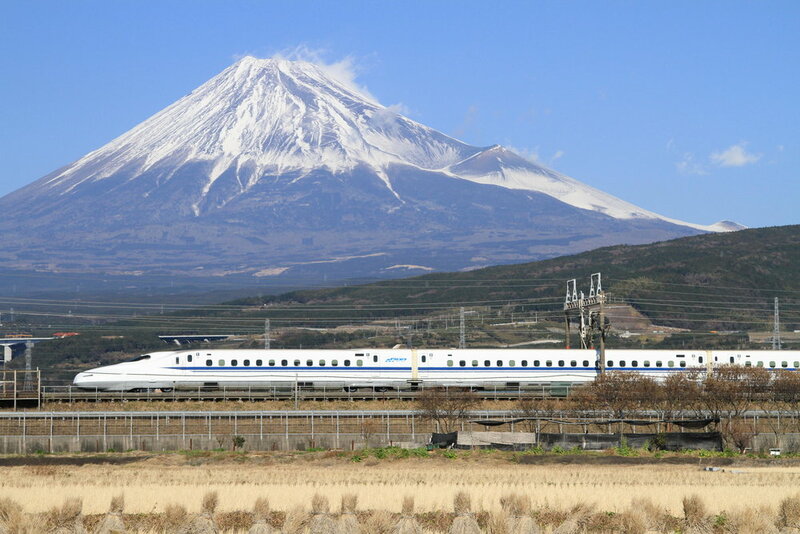 To see Mount Fuji from the Shinkansen train take the Tokaido Shinkansen between Tokyo and Kyoto/Osaka. When departing from Tokyo, the mountain appears on the right side of the train, so plan your seat accordingly. You can see it around the Shin-Fuji Station - about 40-45 minutes into the journey. 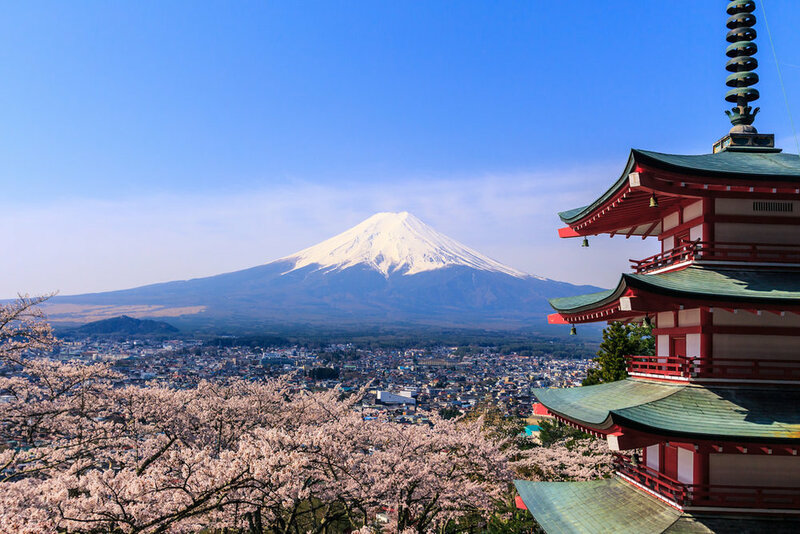 The best views of Mount Fuji can be enjoyed on domestic flights departing from Tokyo's Haneda Airport to destinations in western Japan when the planes often fly very close to - if not right above - the mountain. Flights from western Japan in the direction of Haneda Airport usually pass further south, but can still provide nice views.